Most of us have dealt with acne and the breakouts can be embarrassing, but luckily most acne will fade away in time. The tougher problem is how to get rid of acne scars and acne marks. What removes acne scars? 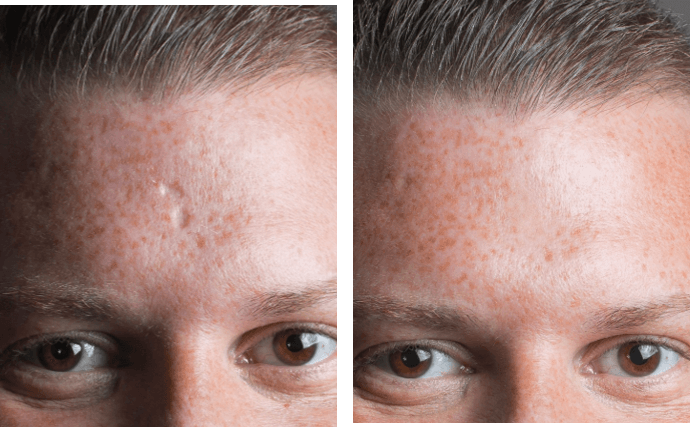 We will review the of acne types scarring and the different products and procedures that you can use to get rid of acne scars or at least fade acne scars. It really depends on the nature of the scar and your skin’s ability to heal itself. The first priority is to treat the active acne first, and prevent the cause of the acne scars. Even though it can be maddening, most skin care professionals all tell you to refrain from picking or popping acne breakouts. This can introduce more bacteria to the inflamed area and cause more irritation. So what can be done after the active acne has subsided and you want to get rid of acne scars and the red or brown marks from acne? Unfortunately, there is no magic wand to make acne disappear instantly. Anyone who tells you otherwise is selling something and not being honest. If you need to look your best in short order, the best option is to invest in some high quality acne concealer makeup, or look into something like a topical acne scar filler. Read on to learn how to get rid of acne scars fast. Acne scars can be removed with a few different options. Depending on the type of acne scar, there are a variety of acne scar products and acne scar procedures that you can look into. Of course, it is always smart to consult a dermatologist who can proscribe the best treatment options for your particular acne scar situation. These are the top suggestions for how to get rid of acne scars. Acne At Home Treatment: Reduce Inflammation with Salicylic Acid, Benzoyl Peroxide. Aid healing process with moisture nourishing silicone in this Acne Scar Cream. Acne At Home Treatment: Skin brightening treatments: Hydroquinone, Retinol, Acid treatments, Vitamin C. Exfoliating Scrubs. Learn how to apply makeup to cover acne by watching the acne concealer tutorial below.